Just want to say a HUGE Thank you for everything!! The wedding from start to finish was one of the best days of our lives. 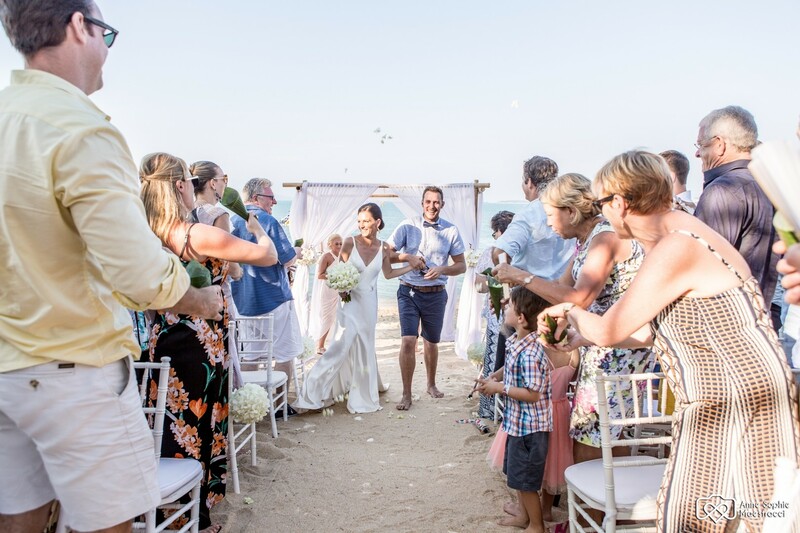 From the very beginning over a year ago, you have always been so helpful, professional and knowledgeable about everything weddings and Thailand! We never had to worry as we knew you were always there to call or email and that as a control freak was bloody great!! You listened to everything we wanted and our hopes for the day and you certainly delivered!! Anna, you put up with us from the beginning and right from the get go have been amazing. Thank you for going above and beyond with your advice and time. Rachel, you were an absolute superstar your professionalism and always being there for anything we needed on the day was amazing! Even smiling and staying calm when Freddy was having a tanty just before walking down the aisle (bloody toddlers)!! Everything about the day looked so beautiful, actually took our breath away, your a clever girl!! It all ran so smoothly, was so relaxed which is so us! Of course we’d go over the bar with our boozy friends but we didn’t care at all was worth it! But all of our friends and family commented on how beautiful and great a day it was, so Thank you! Also Anantara was terrific, Thank you so much Anna for recommending our room. It was quite the social location for our friends and the kids loved the pool! The staff there are amazing especially Lily the kids adored her and we used her a lot! I of course cried when we said bye! Andreas the 2nd manager was also amazing, even lending us his child’s pram for Evie as she’d get to tired at night to walk around!! We felt very special and at home there and will certainly be back, especially to the spa DEVINE!! Feeling very sad and depressed it’s over, it was the most amazing two weeks! I will miss you girls, will feel very strange not emailing and chatting on a weekly basis!! A million Thankyou’s for everything! !